If they're not already on your bucket list, put swimming with these huge, graceful, alien-looking creatures on it now! “Manta! Manta!” The cry we had been waiting for rang out from our guide. 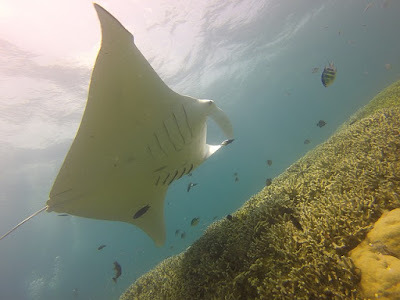 The group I was with had been dropped off at a sandy-bottomed dive site known to be a fairly reliable place to see manta rays during the southwest monsoon and there had been some recent sightings during the days preceding my visit. We were on the eastern side of the Maldives, where the southwest monsoon season (April to November) is the best time to spot manta rays. We’d been sailing around on the traditional wooden ‘dhoni’ (boat) for less than 20 minutes before we got the signal and a surge of adrenaline instantly rushed through me. I was about to see wild manta rays for the first time! Sure enough, the surface of the water was being breached by several triangular pectoral fins. The undersides of their fins flashed white as they sliced through the water and beneath them I could see the silhouettes of yet more manta rays. 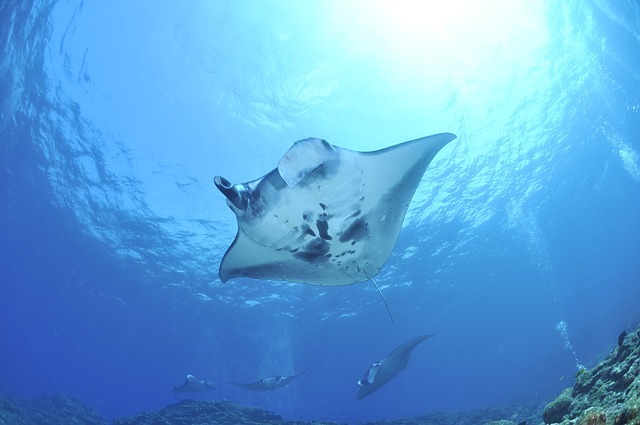 We had stumbled upon a group of reef mantas which although smaller and more common than oceanic mantas are still amongst the largest of any type of ray in the world, at an average of 3 to 3.5 metres wide. Part of the sharks and rays family; mantas are gentle giants which feed upon microscopic zooplankton. Sadly they are rated as ‘Vulnerable’ by the International Union for Conservation of Nature (IUCN) which makes observing them in the wild even more of a privilege. Threats to mantas include pollution, entanglement in fishing nets and even illegal poaching as their gill plates are used in Chinese medicine. 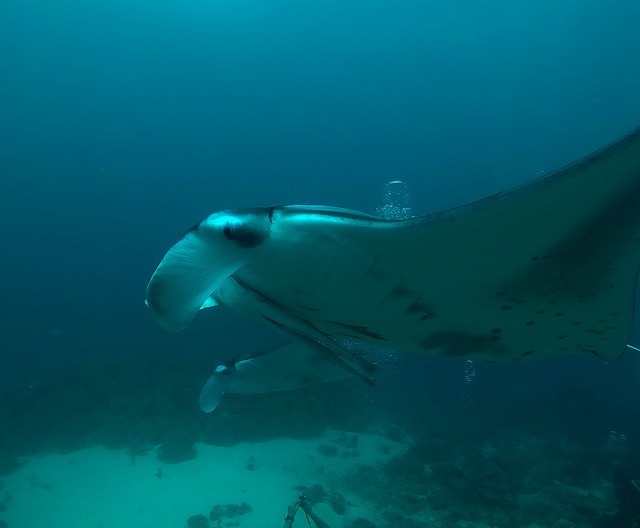 However all ray species are now protected in the Maldives. "Mesmerised by the sight, I remained rooted to the spot as it passed beneath me; unable to take my eyes off it until its shape gradually faded into a blue shadow". We were there to simply marvel at these majestic creatures, and the guide dutifully briefed us that they could easily be startled and under no circumstances may we attempt to chase or touch them as it could cause a great deal of harm. Nodding in agreement, we slid into the water one by one some metres away from where the mantas were swimming. I peered through the slightly-murky water to try to catch sight of the shape of a manta ray and my snorkel almost fell out of my mouth at the thrill of seeing a manta ray glide just a few metres beneath my fins! Mesmerised by the sight, I remained rooted to the spot as it passed beneath me; unable to take my eyes off it until its shape gradually faded into a blue shadow. The underwater visibility in the Maldives is usually superb but there was a large amount of plankton in the water which made it more hazy than usual. The zooplankton was the very reason the mantas had been attracted to the spot. Although zooplankton makes your skin tingle slightly the ethereal spectacle of the manta rays made me completely forget the mild discomfort. My initial surge of excitement barely had time to ebb when I saw the guide pointing in another direction. I turned to see two more manta rays gliding along side by side, funnelling plankton into their strange alien-like mouths with their cephalic fins. Then a third swooped down along the sandy bottom as the imposing figure of the largest manta ray swept into vision. Just look at that alien-like face and body - amazing creatures! As the mantas glided past me I drank in all the details. Their strange triangular ‘wings’, white underbellies, gaping mouths and ability to effortlessly accelerate from ‘cruise’ mode to faster than any human could swim. Their gracefulness and elegance was spellbinding. At this moment I immediately understood why manta rays are on the bucket lists of so many snorkellers and divers. I dived down to about five metres with my snorkel in a vain attempt to share their perspective, wishing that just for a day I could become an aquatic creature roaming the reefs of the Maldives. 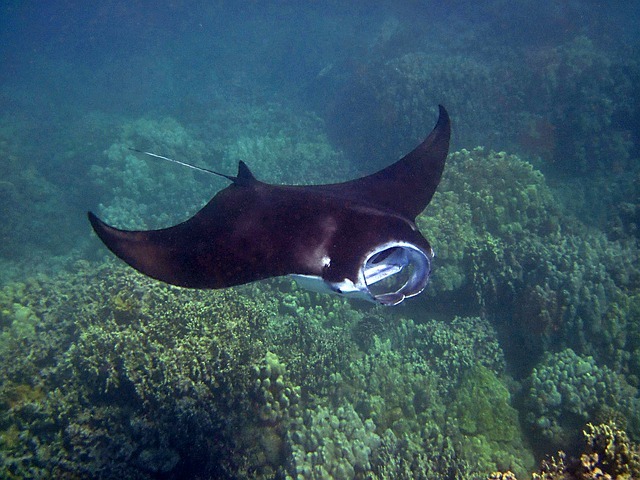 Where the mantas roam varies according to the season and their migratory pattern but there are certain sites where they can be often found including cleaning stations where they go for the removal of parasites. There are countless ‘cleaning stations’ and favoured feeding grounds for mantas across the Maldives. 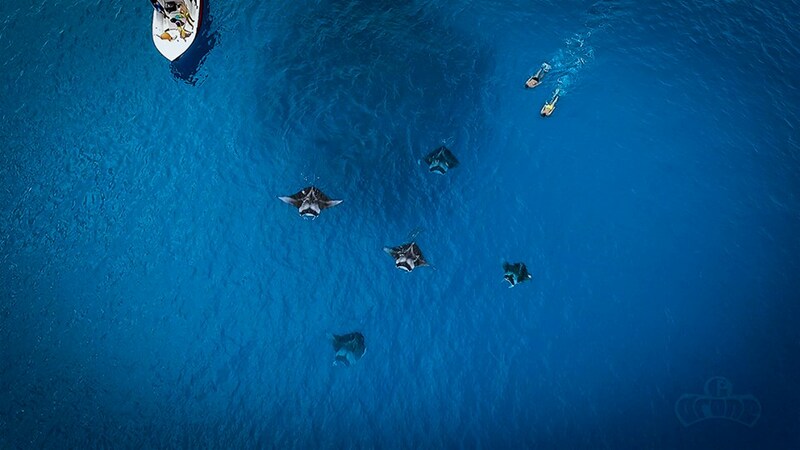 One of the most famous sites for spotting manta rays is Hanifaru Bay in Baa Atoll, a Marine Protected Area and home of the Maldivian Manta Ray Project (which researches and monitors the manta population). Visitors can purchase special tickets to visit Hanifaru Bay via their resort or safari boat. Visitor numbers are monitored and there are regulations in place n order to protect the Maldives’ precious manta population. Ari Atoll is also another good place for sighting manta rays. But in most atolls there will be somewhere named ‘Manta Point’ or at least somewhere which is known as a regular haunt of mantas. Guests on liveaboard boats (diving cruises) stand an excellent chance of seeing manta rays during the right season; not just because they maximise their chances by doing three or four dives per day but also because the lights at the back of the yachts attract plankton which in turn attracts mantas. It’s certainly not uncommon for an exciting discovery of manta rays feeding at the back of the boat at night. A combination of factors including the abundance of food, lack of natural predators, lack of big-scale and commercial fishing and the protection of all ray species in the Maldives are just some of the reasons why the population in the Maldives is in somewhat a better state than in other regions where some populations have seen a 95 per cent decline just in the past few decades. But there’s good news for the species on an international scale. All manta rays and five species of shark have recently been included in the Convention on International Trade in Endangered Species (CITES). It’s an international treaty that forces countries to control the trade of products of listed species. 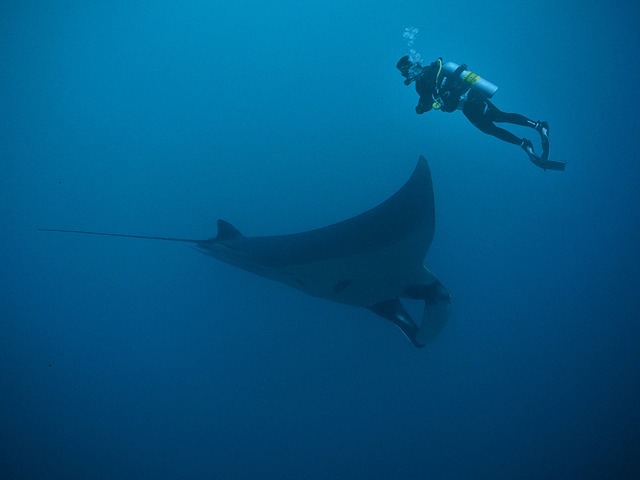 This means that if a country insists on trading in manta products they will need a permit and to provide scientific evidence that it will not be detrimental to the population, which is extremely difficult to do. 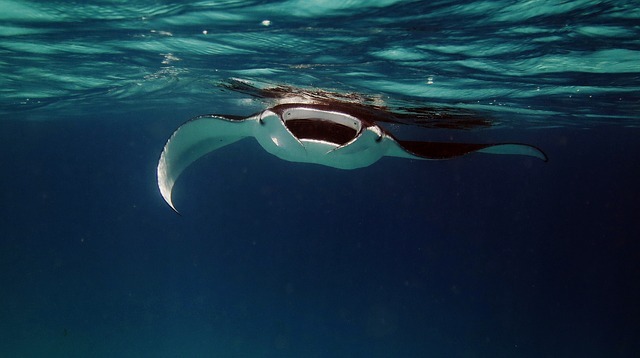 Now do you see why manta rays are so precious? Heck, I even named Manta Media after them!